Provides new and different options for the excellent Eduard kit. 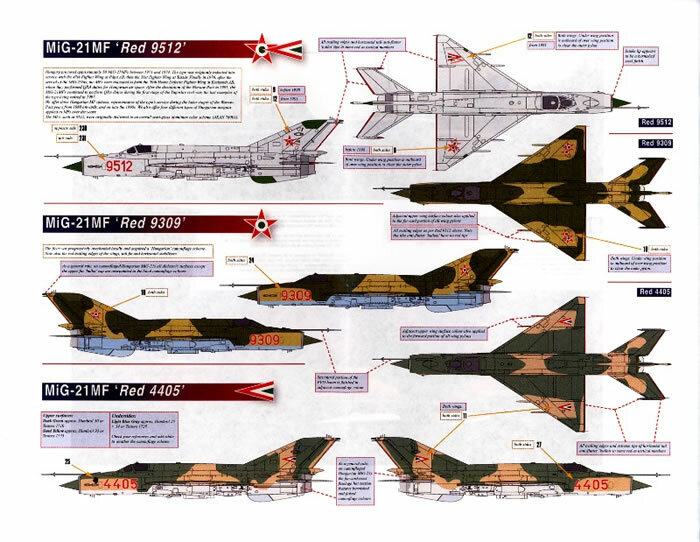 Eduard’s release of a state of the art MiG-21MF in 2011 has opened the floodgates for those not satisfied with the extensive range of options offered in the kit decal sheets or who took advantage of the “overtrees” offer. Linden Hill has stepped in recently to provide options from five Warsaw Pact member Air Forces, expanding the choices for any modeller who wishes to build a MiG-21MF. The MiG-21MF was one of the “third generation” variants of the ubiquitous Fishbed, entering service in the late 1960s and eventually being exported to every Warsaw Pact Country. It formed a key part of Warpac air combat capabilities right up to the dissolution of the Pact in 1991 and in the Air Forces of former members for many years after. 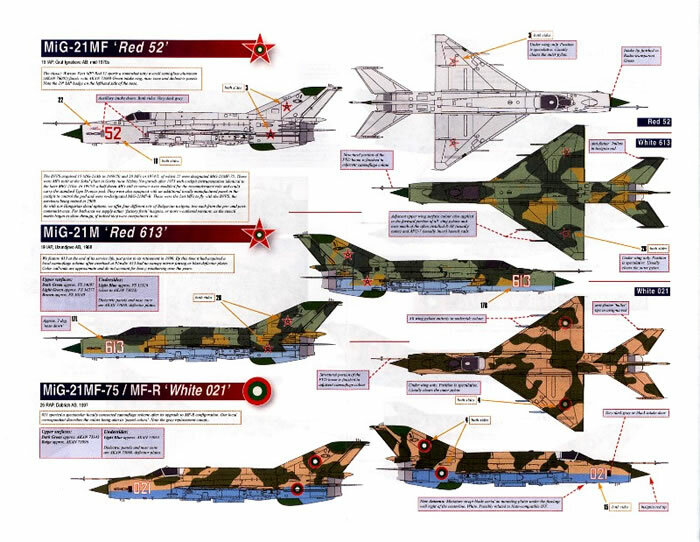 This is reflected in the wide range of subjects Linden Hill have chosen for their third release in the Brothers in Arms series which have previously covered the MiG-23 family in 1/32. 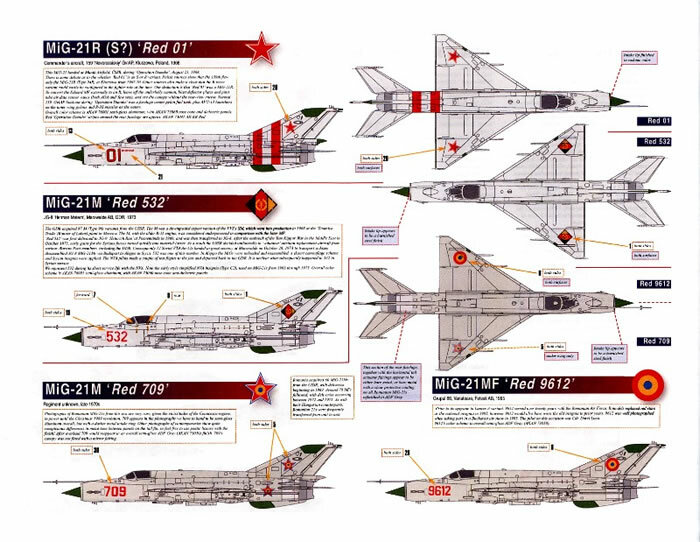 USSR – MiG-21R(S?) Red 01 – Operation Danube August 1968. This aircraft participated in the invasion of Czechoslovakia by other Warsaw Pact member nations in 1968. German Democratic Republic – MiG-21M Red 532 1973. An interesting subject as it only saw very short service with the NVA before being transferred to Syria in late 1973 to make up attrition losses in the Yom Kippur War. Hungary – Red 9512, 9309 and 4405. 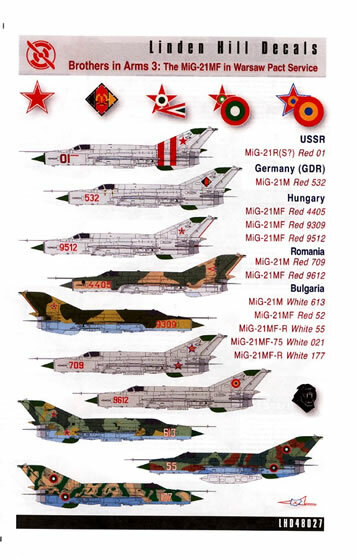 These three options depict the full range of Hungarian operation of the MiG-21MF from 1980 until the 1990s post Warsaw Pact era. 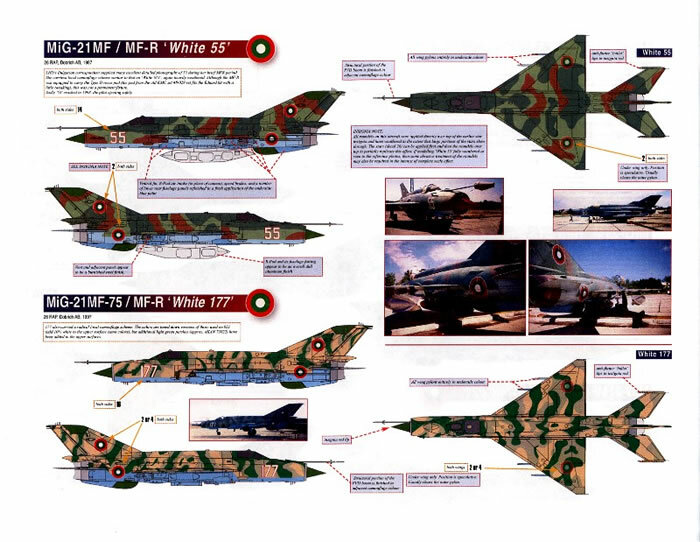 Romania – MiG-21M Red 709 Late 1970s and MiG-21MF Red 9612 in 1995, again depicting the MiG-21 in service with Romania both during and after the Warsaw Pact period. Bulgaria – MiG-21M White 613 1988, MiG-21MF Red 52 early in service in the mid-1970s, MiG-21MF-R White 55 a variant able to carry the Type D Recce pod and depicted in 1997, MiG-21MF-75 White 021 1997 and MiG-21MF-R White 177 again in 1997. All subjects all covered by this decal sheet are well documented in the instructions including a range of colour reference photographs and notes on the camouflage shades used which highlight the heavy weathering of these aircraft, especially towards the end of in some cases a twenty plus year operational career. Where changes are needed to the base kit to depict sub-variants such as the recce types or where modifications where made in 1990s to incorporate NATO compliant systems, these are noted alongside the relevant subjects. Also of use are notes on weapons and pylon configurations such as those applicable to the Operation Danube participants. The instructions themselves are spread over 6 A4 full colour pages and include both sides and top views, particularly important with some of the complex camouflage schemes depicted. Whenever I have used Linden Hill Decals I have found that they are relatively trouble free to apply, respond well to setting solutions such as those offered by Mircroscale, and have very good colour density, registration and absolute minimal carrier film. 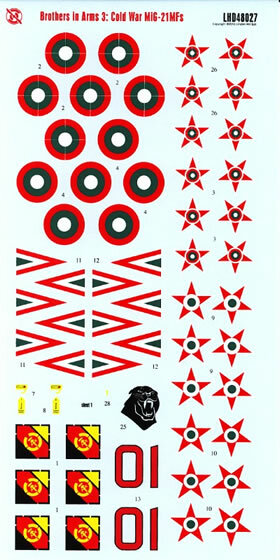 With an outstanding kit of the MiG-21MF available in 1/48 scale thanks to Eduard, these decals will come in most useful for those who wish to depict a subject not offered in the kit or who purchased the “plain packaged” overtrees offered by the manufacturer.